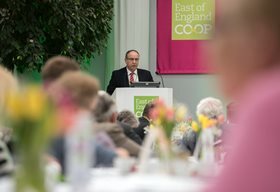 There are lots of benefits to being a member of the East of England Co-op. When we do well, so do our members. We share our profits with our members and this is known as our dividend (affectionately known as the ‘divi’). Every time you shop with us, you earn dividend points*. The more you shop with us, the more you get - it all adds up! * There are a few things like cigarettes, National Lottery, infant formula, PayPoint, Subway, funeral disbursements and prescription drugs that don’t qualify for dividend points. Each of our members owns an equal share of our co-op. That means that you can vote on important things, including our annual Election of Directors, and on motions at our Annual Members' Meeting. Through our Community Token Scheme members can have a say in which local good causes we support, every time they shop with us. Twice a year we publish our members' magazine. It's a great read and is full of inspiring stories from across our region, as well as exclusive offers and interviews. Our tasting panel offers our members an opportunity to sample fantastic food and delicious drinks for free - all they need to do is tell us what they think! We regularly provide exclusive offers just for our members. They feature in our monthly Members' Mashup as well as our biannual members' magazine. Members can invest up to £20,000 in their share account*, which in turn helps us invest in the future of our co-op. In return we'll pay 1% interest on balances up to £20,000. To obtain your special 12.5% discount, simply take your Membership Card along with you when you visit your nearest Mattressman store and present it when you place your order – it’s easy! What’s more, orders over £45, made before 4pm Monday to Friday, qualify for free delivery (Mainland UK only). Offer applies to full priced items only, cannot be used in conjunction with any other offer and is not available on line. Offer expires 30/09/19. Set in beautiful landscaped grounds overlooking the river Orwell and Wherstead Parish Church, Members can now earn dividend points on wedding venue hire. Visit www.whersteadpark.co.uk to find out more. Present your membership card at the time of booking. Choose from 2 wonderfully modern and spacious self catering apartments in the heart of this vibrant village on the Suffolk coast. Members can now earn dividend points on the holiday cost. Choose from Pigeon Hole or Snail Mail. Fancy a break? Simply book your holiday through www.bestofsuffolk.co.uk and then, phone the East of England Co-op on 01473 786001 to confirm your holiday details and your membership number. Dedicated to bringing you high quality workmanship and an efficient competitive service, HL Perfitts has a wealth of experience in the selection, manufacturing and installation of natural stone. Members can now earn dividend points on stone masonry, stone /slate house signs and granite kitchen worktops. Security solutions to protect your home and belongings from the East of England Co-op. Members can now earn dividend points on CCTV or Alarm monitoring services. Make sure you take advantage of all these brilliant member benfits by 'opting in' to recieve communications from us. *Members are advised that share investments with the East of England Co-op are classified as risk capital. In the unlikely event that we fail, you may not have all or any of your investment returned to you. You can withdraw your funds without penalty. Unlike Banks and Building Societies, the Society is not subject to prudential supervision by the Financial Conduct Authority.